Updates and behind the scenes from the team behind GoAssign. We're excited to announce the arrival of some highly requested features that were added to GoAssign this last month. 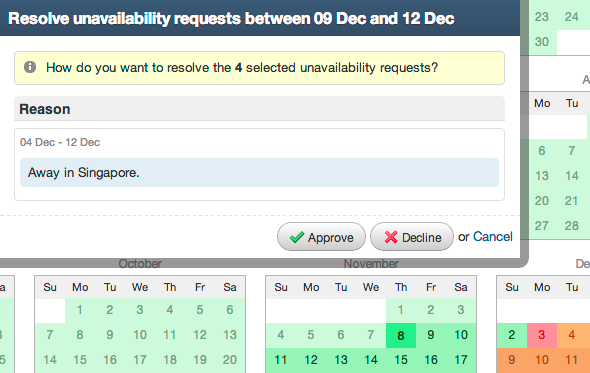 Once enabled, this feature allows your people to request their unavailability, instead of immediately marking themselves as unavailable. Below we can see Mary requesting time off in Singapore. Requested days are shown in orange. 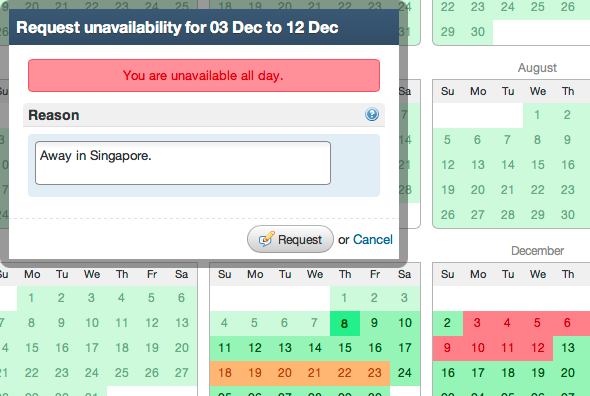 Once requested, unavailability has to be approved by a manager or administrator before the person becomes unavailable. Below we can see administrator John approving or declining Mary's time off. John can approve some days and decline others if need be. If you haven't already you can enable Unavailability Approvals via your accounts Behaviour Settings. 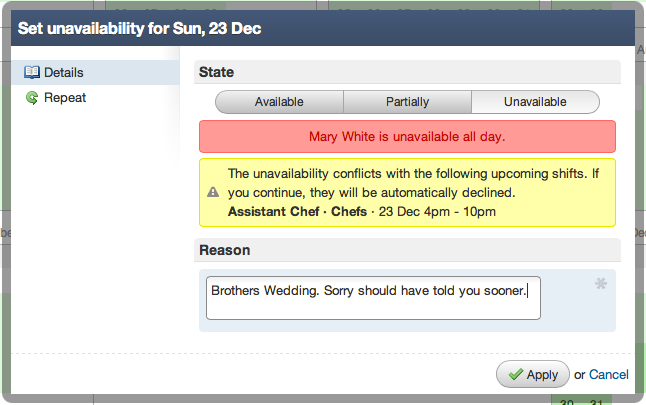 GoAssign now displays conflicts with other shifts and conflicts with a users unavailability right from the week view. 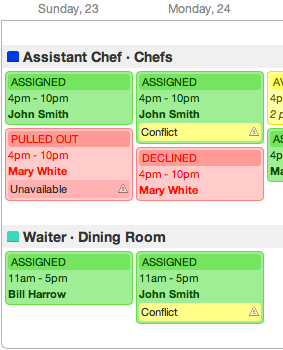 Below we can see that John has two shifts that conflict because they are on at the same time and Mary has a shift that conflicts with her unavailability. 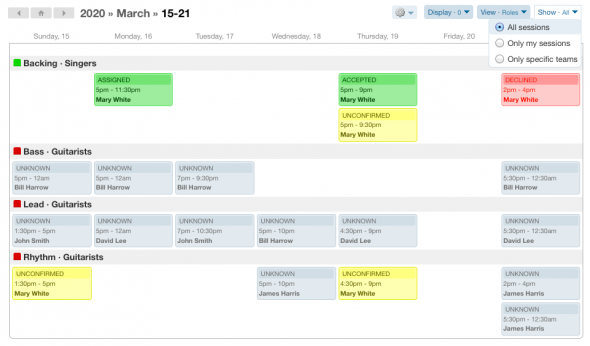 When a user is about to create an unavailability conflict (by making themselves unavailable after they have already been assigned), we now indicate to the user that they are creating a conflict and also force them to pull out of the shift. 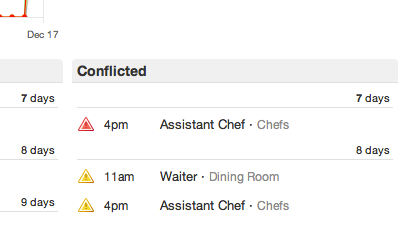 Also, so you don't have to go hunting around week by week to find conflicts we now display them conveniently on your dashboard. We hope you enjoy the new features and please let us know via our Support Portal if you require assistance with any of the above. We look forward to showing you some of the new features we are working on in the near future. 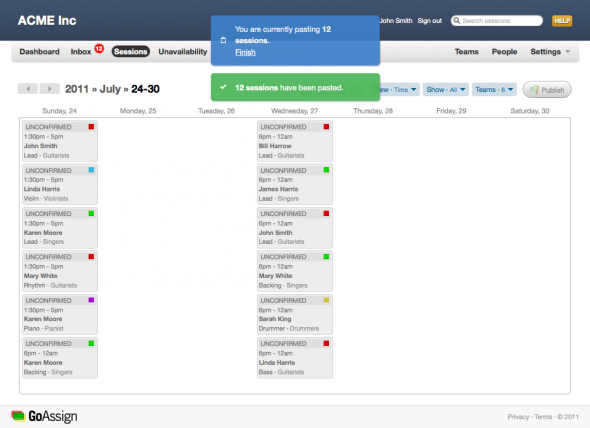 Our customers have asked us how they can allow team members to view an entire schedule without giving them managerial rights, so today we added just the feature to allow them to do exactly that. When editing a person within a team, you will now find a new option to give that person view-only access. For privacy reasons, unlike managers, view-only users will not be able to see the state of a task or any personal messages attached. 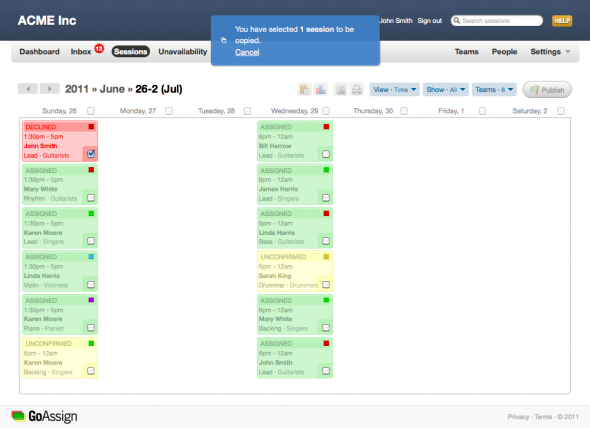 We hope this new feature makes your teams even more productive. If you have any questions, as always, feel free to contact us or ask a question on our support portal. Today we are proud to announce the new addition of breaks to GoAssign. 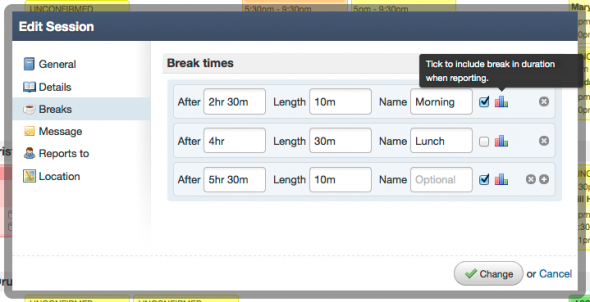 Breaks allow you to specify meal breaks, extended breaks or any other type of break you require. Breaks are easy to setup. Simply specify how long after the start time the break should be taken, then specify the length of the break and optionally give the break a name. You can also select whether the break is reportable. Breaks that aren't reportable won't add to the total duration, allowing you to specify that the break is unpaid. Once breaks have been added they can be viewed via the new 'Display' dropdown which allows for more information to be temporarily displayed. We hope you enjoy this new addition to GoAssign. As always, if you have any questions regarding anything in GoAssign, don't hesitate to ask us a question via our Support Portal. 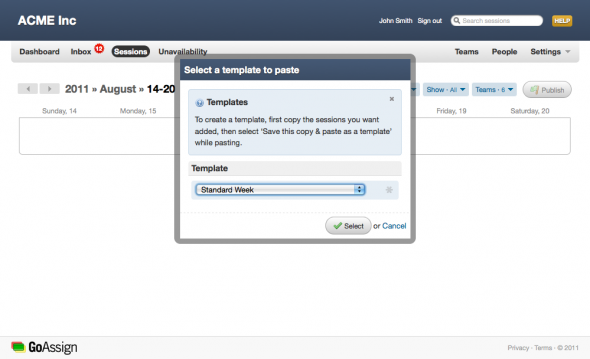 We are very excited to introduce the ability to copy & paste schedules and optionally save them as templates for later use. This will save you hours of re-entering schedules, as more often than not, they are the similar to prior weeks or months. Let's take a look at an example! The ACME Inc band had previously entered a schedule for two days which they want to re-use. The band assigns their people to 'sessions' (you may call them tasks, jobs, shifts or something else). John, the manager of the band, simply selects "Copy" on the first session to start the copy process. 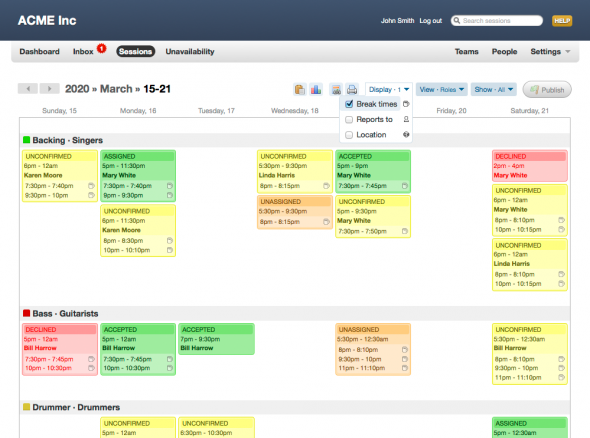 From there, he selects two days worth of sessions by clicking on the checkbox at the top of each day, instantly selecting all the sessions for that day. Next, he navigates to the day he wants to paste the copied sessions and clicks on a blank area to paste. 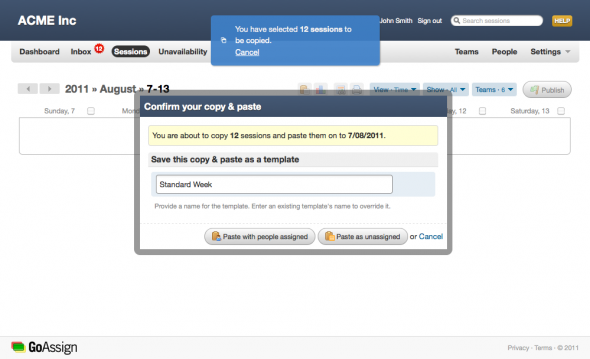 A confirmation dialog asks John whether he wants to paste the sessions with people assigned or as unassigned so he can assign new people. In this case he chooses with people assigned. A second later John is done. He has successfully copied and pasted two days worth of sessions. He can continue to keep pasting the same sessions on to other weeks or click "Finish" to end. 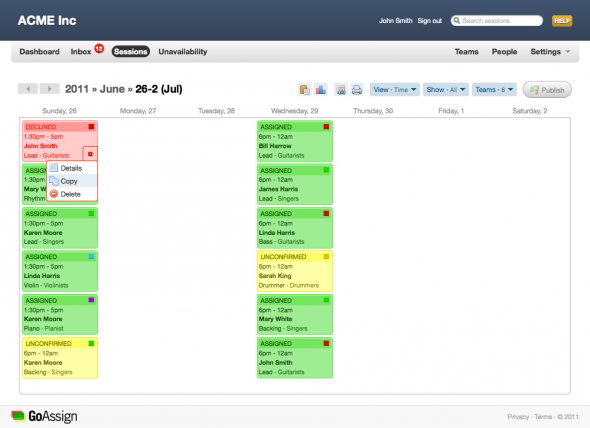 Now, if this was a schedule that occurred regularly, John could have saved time by saving it as a template which he could re-use again and again. To do that, before performing the first paste he could have entered a template name as shown below. Then later on, he could re-use it by selecting it from the template dialog as shown below. This eliminates the need for John to find the sessions to copy each time and allows you and your organization to build up a collection of commonly used templates. We look forward to seeing how you make use copy & paste and how much time it ultimately saves you! Enjoy. More often than not, the role the person will perform is the same as, or very close to, the task that is to be performed. So Ben is a Shelf Stacker (role) and he will Stack Shelves (task), and Janet is a Team Manager (role) and she will Team Manage (task). Up until now, GoAssign only supported this assumption. But what if the role a person is to perform doesn't describe the task in enough detail? What if you wanted to see something more on your roster than simply the role? For example, the name of an event they will have to attend to perform the task, or a special id that you use to describe the task, or any other number of organization specific possibilities? For that reason, we have introduced Titles. Titles replace the usual display of "Role · Team" for tasks and display the more descriptive title instead. As you can see in the screenshot below, instead of only saying that Karen Moore is a Backing Singer from 6pm-12am, we might want to actually say she is Backing for Katy Perry! Which we can now do with the new Titles feature. We hope you enjoy this great new addition to GoAssign and we look forward to bringing you more like it in the near future. Please let us know via our support portal if you have any questions regarding this new feature. © 2010-2019 Meticulous Methods Pty Ltd.